We truly enjoyed trying RE Botanicals Hemp Tincture, a very high quality CBD oil. The care that RE Botanicals puts into their products shines through from the start. Everything about their tincture exudes quality and elegance, from the twist off cap, the ease and responsiveness of the dropper to the clean looking package. We knew this hemp extract was going to be an experience! Upon opening, we immediately noticed a fresh hemp scent that wasn’t overpowering, but strong enough that we just knew quality hemp was used. The extract itself was almost colorless with just an ever so slightly yellowish tint. The taste didn’t disappoint either. The team ingested the CBD in three ways: sublingually, on the tongue, and in coffee. All three ways yielded the same results: a nice silky texture that didn’t leave an aftertaste like some extracts we’ve tried. Yet there was still a modest hemp taste that we all enjoyed. Even when we put RE Botanicals Hemp Tincture directly into coffee, the coffee taste wasn’t altered much, which can sometimes happen with CBD extracts. Our team also found this extract effective at reducing chronic pain and relaxing to consume, too. RE Botanicals Hemp Tincture tastes great, and left our reviewers feeling relaxed. RE Botanicals paid us a fee and offered us free products in return for our honest opinion. If you purchase a product from one of these links, we’ll receive a percentage of sales. Read more about sponsored content on Ministry of Hemp. Read on to learn more about RE Botanicals and see our complete product breakdown. RE Botanicals is proud of their sustainable growing methods. John Roulac founded RE Botanicals after 20 years in the hemp industry. In 1999, long before creating RE Botanicals, he founded the superfood brand Nutiva. Roulac and RE Botanicals focus on organic and regenerative agriculture. Regenerative agriculture is a holistic land management practice that closes the carbon cycle, builds soil health, crop resilience and nutrient density. One percent of all RE Botanicals sales are donated to support regenerative agriculture and help farmers create healthier soil. According to RE Botanicals, the extract process starts with organically grown hemp. This helps maintain healthy soil biology. Hemp is climate-friendly because it sequesters carbon in the soil. They use a proprietary alcohol extraction method that employs a full spectrum extract, never an isolate. RE Botanicals then blends the full-spectrum organic hemp with organic MCT coconut oil from young coconuts. At first, we were somewhat confused by the labeling, until we realized that RE Botanicals Hemp Extract is labeled by the dose, rather than per bottle. This contrasts with many other CBD brands on the market. At 25mg of CBD per dropper, that makes 750mg of CBD per bottle, a fairly standard amount. Other than this, RE Botanicals tincture is clearly labeled with a bottle that’s easy to read and lists all the ingredients. We also appreciate that they make their lab tests easily available on their website. 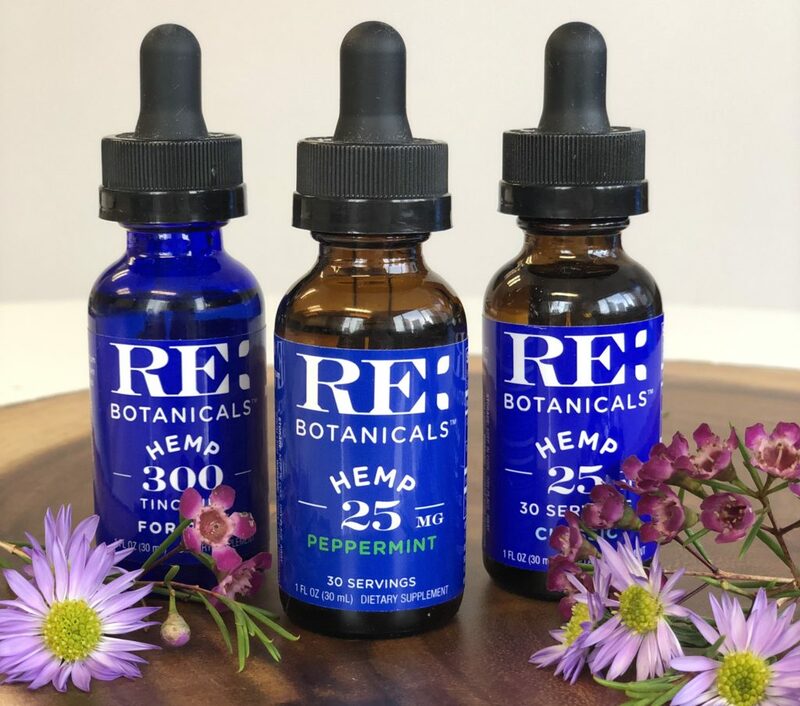 Highlights: RE Botanicals Hemp Tincture is an effective, high-quality CBD oil with a silky texture and a clean hemp taste. Customer Service & Shipping: Fast, friendly customer service. Free shipping available on orders over $50. Flavor & Texture: This unflavored tincture tastes mildly earthy, with notes of green tea, with a pleasantly silky texture and almost no aftertaste. Ingredients: CBD oil / Full Spectrum Hemp extract in Organic MCT (Coconut-based) oil. Other: RE Botanicals offers a generous 30-day, money back guarantee for unsatisfied customers. RE Botanicals uses U.S. hemp, grown under organic methods, in all their products. In addition to tinctures, RE Botanicals offers CBD capsules and CBD for pets.